About 1 month ago I started taking a class at the local community college. The class is Fitness Testing and I have been loving each day we meet for class. So far I’ve been learning how to do health assessment/screenings, body composition (BMI, body fat, etc.) and cardiorespiratory fitness testing. Much more to come in the next month and a half. As for cardiorespiratory fitness testing we’ve gone through a bike test, a treadmill test and this week we get to do VO2Max testing which is going to be pretty intense. You run on the treadmill with a gas mask on and EKG hooked up and basically run to your max, at a steady increase in speed and incline. I’ll talk more about the VO2Max testing after I go through it myself because that’s not what I’m here to talk about today. Because of my class I got the opportunity to volunteer at a half marathon going on in town. My mom and I during our first half marathon in January. The race needed volunteers to help stretch the ladies once they were done and so I joined in on that. I’ve never volunteered at a race before but am so glad I did. The women that finished the run were all so positive and happy. It was amazing to hear about their race and each and everyone of them was proud of how they did. 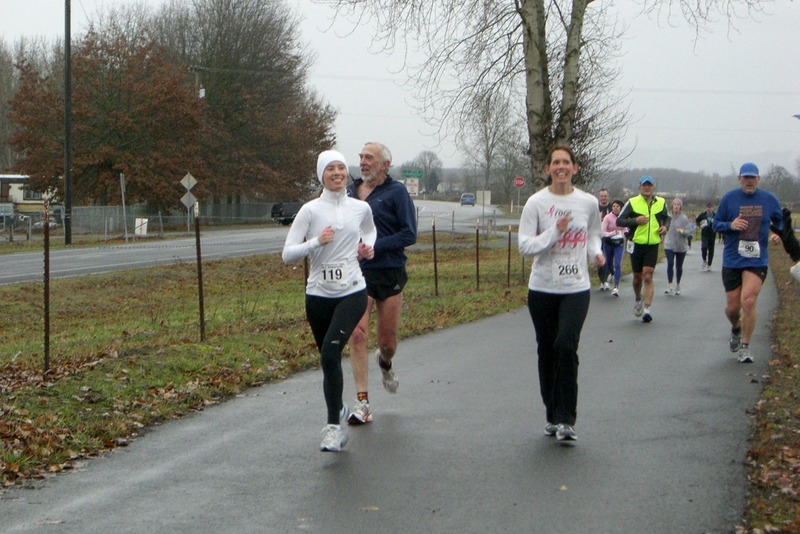 The race benefitted Susan G. Komen for the Cure®. Since October is breast cancer awareness month, it was the perfect time to hold this run and I was glad that even though I didn’t take part in the run, I could help out one little bit. We're finishing up strong during our second half marathon in July. Other than this event, I’ve never really volunteered for much else. At least nothing I can think of off the top of my head. I know that after running 13.1 miles that last thing I want to do is stretch a lot, I’m way too tired. It was great to help these women out yesterday. They were all so appreciative too. Have you ever volunteered at a local fitness event? Do you volunteer elsewhere? I know I should volunteer more of my time and I hope to in the future. I’ve never volunteered for a fitness event. Honestly I’ve never thought to do so. What a cool way to help out though. I did volunteer when my sister did a half marathon. I love the idea of helping girls stretch. I am sure you were such a great help! Wow, you both look amazing and SO strong! Congrats! What a great event to help at! I love volunteering at races just as much as running them…it gives me the feel-goods! For the past two years my mom and I have volunteered at a walking race (13 miles!). Our job was too make sure no one ran. This sounds dumb, but they all take it VERY seriously!! It’s crazy. We always have a really fun time. I’m glad you and your mom had fun too. What a great race to volunteer for with your mom! I’m all about supporting the races for breast cancer. Such a good cause.